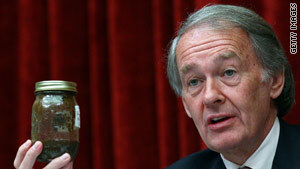 Rep. Ed Markey, D-Massachusetts, holds up a jar of oil taken from the Gulf of Mexico during a hearing. Washington (CNN) -- Rep. Edward Markey on Monday challenged the assertion by oil giant BP's chief executive that no underwater oil plumes have formed because of the Gulf of Mexico spill. In a letter to BP, Markey, D-Massachusetts, said scientific evidence showed such plumes have formed and he asked for BP CEO Tony Hayward to provide evidence to back up Hayward's claim Sunday that the spilled oil had gone to the surface. On Sunday, Markey, who heads the House Energy and Environment subcommittee, had accused BP of issuing false statements about the oil spill. "BP in this instance means 'Blind to Plumes,'" Markey said in a statement Monday. There was no immediate response from BP. Markey's letter to BP said "the confirmation of the presence of large quantities of oil sub-surface could help to inform clean-up and response efforts, and it is vital that there is unfettered access to all relevant data or analysis." The letter noted that University of South Florida researchers recently reported finding a 22-mile-long plume of dispersed oil. In a separate letter Monday to BP, Markey called for complete transparency regarding video feeds of the company's underwater operations. BP is launching a new effort to cut an opening to the leaking equipment so that a containment dome can be lowered on it. "There cannot be any delay or gaps in our understanding of this situation, given that thousands of barrels of oil are spewing forth each day into the Gulf, with catastrophic long-term consequences," said Markey's letter to BP America head Lamar McKay, later adding: "BP should not be controlling the view the American public has of this disaster in our ocean."